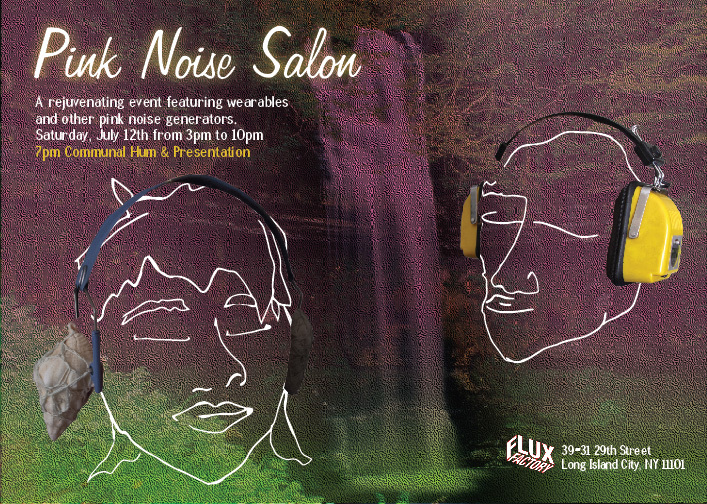 A salon of wearables and other pink noise generators featuring a group hum. 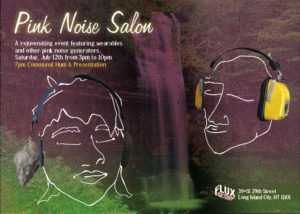 Pink Noise Salon from Caitlin Foley on Vimeo. 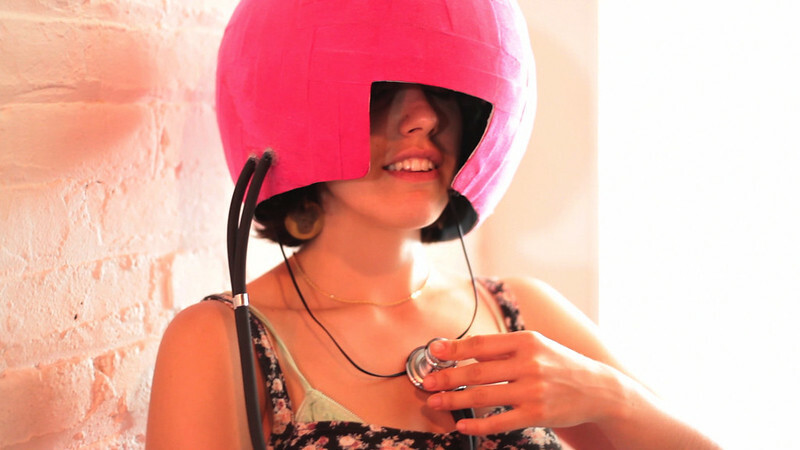 The Pink Noise Salon is a comfortable lounge which invites people to listen to the ocean while wearing Shellphones, to tune into the Pink Noise Pirate Radio station, and to close their eyes to better hear the amplified sound of their own heart beat while wearing a Heart Hat. Various other noise generators include a bucket of sound and rustling paper leaves, among others. Additionally, the salon provides an environment in which to host communal hums and lecture/presentations on different uses and interpretations of pink noise. Pink noise is known to have relaxing, meditative effects and is notable for its occurrence in nature. CDs and phone apps claiming to provide relaxation often include pink noise as the sound of ocean waves. It can also be generated electronically (e.g., for calibration of audio equipment) but it should not be confused with white noise. White noise is the sound of every frequency driven at maximum energy often associated with the harsh machine-like hiss of static. Pink noise, on the other hand, features an inverse relationship between frequency and volume, so that as the sound gets higher pitched it becomes quieter, and the same amount of noise power is distributed to each octave. Interestingly, the sound of many radio stations or YouTube channels playing simultaneously tends toward pink noise. The Pink Noise Salon investigates the value of pink noise as a means of filtering cultural over-stimulation. Additionally, the salon places the analog production of pink noise found in nature alongside human made pink noise as evidence of human integration with and impact on the environment. The Pink Noise Salon presented at the Flux Factory included a presentation by neuroscientist and founder of Inter Space, Tricia MacKenzie, Ph.D., on “Hearing vs. Being Pink Noise” followed by a participatory communal hum led by Caitlin Foley and Misha Rabinovich. Pink food and drink enhanced the rejuvenating effects of this Saturday afternoon salon. Participating Artists included Danny Crump, Jung In Jung, Will Owen, Julius Shmiedel, Tina Kohlmann, and Tricia MacKenzie. The communal hum is an exercise in Deep Listening. Participants are led through a series of exercises concluding with a 5-10 minute hum. The hum is recorded, graphed, and compared with the graph of pure pink noise. The Pink Noise Salon is a collaborative project with Misha Rabinovich.